Hi, everybody, and happy May! It’s time for a new Clean and Simple challenge at Make It Crafty! Thanks to everyone who entered the April “Sketch” CAS challenge! Our challenge for this month is SUMMER! While it doesn’t exactly feel like summer in my part of the world (and that’s totally OK), we’re inspired by sunny skies, warm temperatures, and the beach for this challenge! My accent was made with some floral wire that I curled around a pen. I secured both ends to the card front and the back of the skirt. Normally, I would have used one of the pre-made springs, but the piece that I wanted to add the motion to was much smaller than those, and I didn’t want to have to trim the spring all the way down to fit. I still have a few things to work through on the process of making my own wiggle spring, and I plan to put together a tutorial so show you how I made it very soon! I’ll have a new card to share with you on the Make it Crafty inspiration blog on May 9th, and I’d love it if you stopped by to say hello! For more examples of the challenge theme and the details on this challenge, stop by the Make it Crafty blog and look for the challenge graphic on the right-hand side! Our challenge runs through the month of May, so there’s plenty of time to challenge yourself and play along with us! We can’t wait to see your entries! Thanks so much for stopping by today! I hope your week is off to a great start! Hi, everybody, and happy April! It’s time for a new Clean and Simple challenge at Make It Crafty! Thanks to everyone who entered the March “Masking” CAS challenge! Our challenge for this month is a sketch! I chose the new “Koi Fishes” digis for my main image, and the sentiment is a rub-on that I had in my stash. And here is the sketch for our challenge! I’ll have a new card to share with you on the Make it Crafty inspiration blog on April 9th, and I’d love it if you stopped by to say hello! For more examples of the challenge theme and the details on this challenge, stop by the Make it Crafty blog and look for the challenge graphic on the right-hand side! Our challenge runs through the month of April, so there’s plenty of time to challenge yourself and play along with us! We can’t wait to see your entries! Make It Crafty March CAS Challenge! Hi, everybody, and happy March! It’s time for a new Clean and Simple challenge at Make It Crafty! Thanks to everyone who entered the February “Splats” CAS challenge! Our challenge for this month is “Masking.” I chose the Frenchie Claudine digi for my main image, and the sentiment is one of the phrases from the “Outlined Words With Love” chipboard set! The Swiss Dot background is part of a rubber stamp set coming soon to the Make it Crafty Store! I’ll have a new card to share with you on the Make it Crafty inspiration blog on March 9th, and I’d love it if you stopped by to say hello! For more examples of the challenge theme and the details on this challenge, stop by the Make it Crafty blog and look for the challenge graphic on the right-hand side! Our challenge runs through the month of March, so there’s plenty of time to challenge yourself and play along with us! We can’t wait to see your entries! Hi, everybody, and happy February! It’s time for a new Clean and Simple challenge at Make It Crafty! Thanks to everyone who entered the January “No Image” CAS challenge! I know that because we all love to color Make It Crafty’s fabulous digi and rubber stamp images, we didn’t have many players last time, but we did have several brave players who took on the challenge and made some fabulous cards! Our challenge for this month is “Splats.” I used a few of my Copic reinkers to make a background and dropped ink in a few different colors on plain white card stock. My main image is the Levana Lover Letter digi, and the sentiment is one of the phrases from the new “Outlined Words With Love” chipboard set! I’ll have a new card to share with you on the Make it Crafty inspiration blog on February 9th, and I’d love it if you stopped by to say hello! For more examples of the challenge theme and the details on this challenge, stop by the Make it Crafty blog and look for the challenge graphic on the right-hand side! Our challenge runs through the month of February, so there’s plenty of time to challenge yourself and play along with us! We can’t wait to see your entries! Hi, everybody! I hope the new year is off to a great start for you! I’m still on a bit of a break from school, and it has been nice to get some extra crafting time. I’m mostly using the time to work ahead on my design team assignments, so I don’t feel so rushed when it’s time for classes again! Thanks to everyone who entered the December challenge at Make it Crafty, “Cut Out Color Pop”! I can’t wait to see what everyone creates for this one, because it was definitely a challenge for me! We all love to color Make It Crafty’s fabulous digi and rubber stamp images, so it may come as a shock to you that our CAS challenge this month is “No Image”! I’ll have a new card to share with you on the Make it Crafty inspiration blog on January 9th, and I’d love it if you stopped by to say hello! For more examples of the challenge theme and the details on this challenge, stop by the Make it Crafty blog and look for the challenge graphic on the right-hand side! Our challenge runs through the month of January, so there’s plenty of time to challenge yourself and play along with us! We can’t wait to see your entries! Hi, everybody! I can’t believe August is here already! We’re kicking off a new Clean and Simple challenge today at Make it Crafty’s inspiration blog! Thanks to everyone who entered our July shaker card challenge! We had so many fabulous entries this month, and I can’t wait to see what everyone creates for this one! Our new challenge has a “cropped image” theme, which basically means to enlarge one of the digital images and crop it (so you won’t be coloring the whole image). 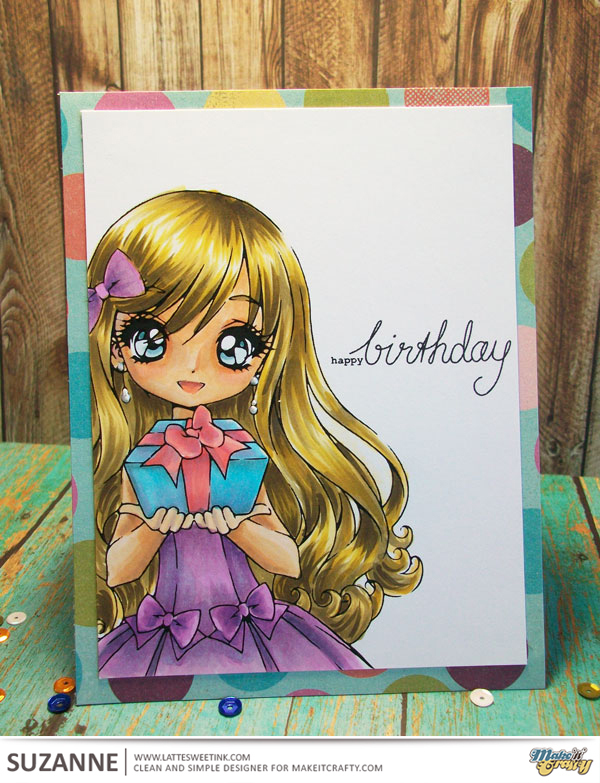 I chose the Lou Gives digi stamp and the Happy Birthday digital sentiment for my card! I love how this technique showcases the main image, and I can’t wait to make another one in this style! I’ll have a new card to share with you on the Make it Crafty inspiration blog on August 9th, and I’d love it if you stopped by to say hello! For all of the details on this challenge, stop by the Make it Crafty blog and look for the challenge graphic on the right-hand side of the blog! Our challenge runs through the month of August, so there’s plenty of time to play along with us! We can’t wait to see your entries! Hi, everybody! Did you see the announcement about Make It Crafty’s new CAS (Clean and Simple) team? I’m super excited to be part of this team of talented ladies, and we’re going to have tons of inspiration for you! The theme of our challenge is to create your own background on your entry. For my card, I chose MiC’s fabulous “Felicity” digi stamp. I made the neon part of the background by applying ink over a stencil that I made with my die cut machine. I used a strip of striped paper to break up the bright background pattern. My only other additions to the card front were the sentiment and the main image! For all of the details on this challenge, and to link up your entry, stop by the Make It Crafty blog! We can’t wait to see what you create!